VW Transporter T6 DropsideVolkswagen Commercial Vehicles has introduced a selection of single and double chassis cabs to the latest sixth generation Transporter range. Basic prices start at £20,400 (excl VAT) for a long-wheelbase single cab 140hp 2.0TDI Euro 5 Startline with a six-speed manual transmission. A seven-speed DSG twin-clutch automatic gearbox can be specified as an alternative and currently the 140hp diesel is the sole powerplant choice. It does, however, come fitted with BlueMotion Technology as standard which brings with it Start/Stop, low rolling resistance tyres and regenerative braking. New Transporter Chassis Cab can accommodate up to six passengers in double cab form and offers a gross payload potential of up to 1,339kg in single cab configuration. 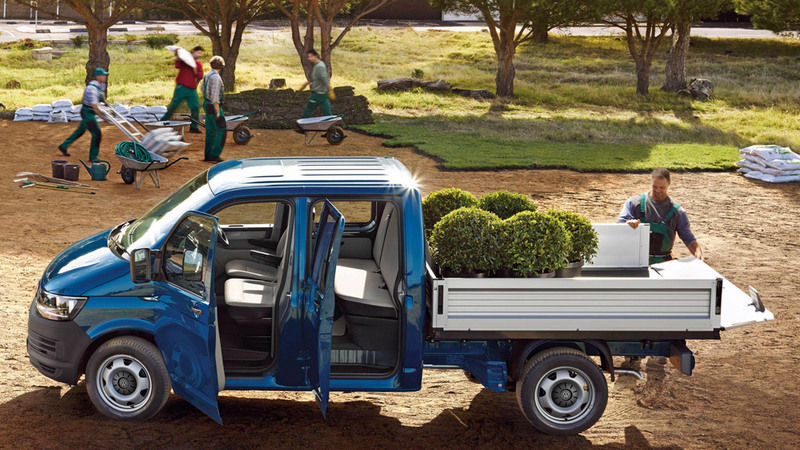 There are factory-fitted dropside bodies available which offer 5.2m2 and 4.2m2 of load bed floorspace on the single and double cab respectively.